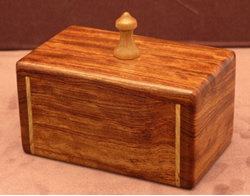 Similar to the other rectangular trinket box, this version features contoured shaped sides to provide it with a unique design. This small trinket jewelry box is the perfect choice to store rings, earrings, or any other small items. Bubinga was used to craft the body along with Maple for the accents.